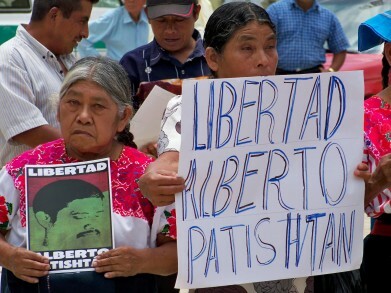 Now that hope of a just intervention by the Mexican courts has disappeared, due to the refusal of the Supreme Court to take Patishtán’s case, national and international solidarity remains as an alternative. On March 6th, the Supreme Court of Justice of the Nation (SCJN) decided not to resume [its jurisdiction] in the case of Alberto Patishtán Gomez – by three votes against, from the Ministers José Ramón Cossío, Jorge Pardo and Alfredo Gutiérrez Ortiz Mena, and two in favour, from Olga Sanchez Cordero and Arturo Zaldivar -. They refused to hear the case which was raised with them by Strategic Defence of Human Rights team, which consists of Leonel Rivero and Sandino Rivero. The SCJN has delegated the case to the Tribunal Court in Tuxtla Gutierrez, Chiapas, which has already ruled against the release of the political prisoner previously.